One of the biggest story lines out the opening night of the 5-Hour ENERGY Knoxville Nationals presented by Casey’s General Stores was as much about who didn’t make the feature as it was about who did. Only three of the top 10 qualifiers made it through heat races with Aaron Reutzel, Kerry Madsen and Kyle Larson being the drivers that got the task completed. Once the dust settled on the B-Main it appeared fast qualifier Logan Schuchart had punched his ticket to the feature until being disqualified for not immediately going to the scales following the B-Main. This process is normally automatic to the point where I was typing the results from that event when I heard the call come over the one-way radio for Austin McCarl to get ready for the feature. Instead of likely being locked into Saturday’s A-Main Schuchart ended up 24th in points overall. Proving once again situational awareness is key at these big races. Other notables that did not make the feature included Paul McMahan, Kasey Kahne, Sheldon Haudenschild, Brent Marks, Cole Duncan, Shane Golobic, Jason Sides, and Hunter Schuerenberg. Anytime Donny Schatz ends up in the B-Main it’s a story. Schatz bounced back quickly from a less than stellar heat race performance to end up winning the B-Main and charging from 21st starting spot to fifth in the A. Ian Madsen made the same type of run through the field Schatz did driving from 22nd to 6th. While it’s not official yet, it appears Gio Scelzi is likely to supplant Jeff Gordon as the youngest driver to make Saturday’s A-Main at the Knoxville Nationals. Turning 16 years of age in April, Scelzi put in a solid qualifying night effort that has him sixth in Nationals points. 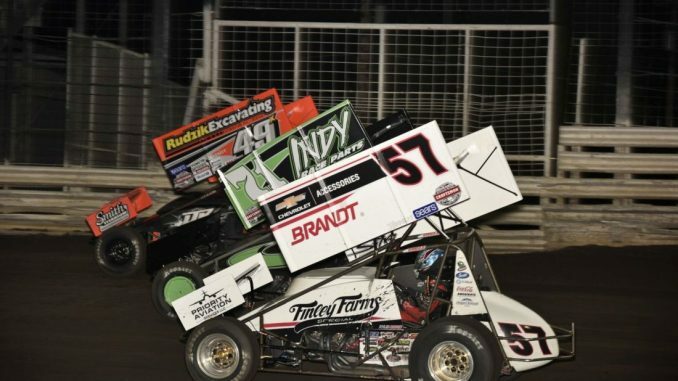 The two cars involved in the only red flag during Wednesday’s feature ended up being two of the teams that put the most work into their special Knoxville Nationals paint schemes. Jamie Ball’s team had to rebuild their Lightening McQueen type replica after a big crash during the 360 Knoxville Nationals while Vander Ecken Motorsports went as far as to wrap the radius rods and torsion arms on their car. The Nationals was off to a decent start for both Ball and Knipp transferring to the feature with Knipp winning his heat race. Both drivers ended up in the same incident in the A-Main and thankfully exited the cars under their own power. Ball extremely upset with Knipp upon exiting his machine. Doug Clark, Justin Clark, and Ethan Gordon debuted their new helmets on the flag stand on opening night of the Knoxville Nationals. The flagging crew at Knoxville worked with Bell on the helmets to better protect themselves during racing action. If you are into numerical oddities Golobic, Haudenschild, and Bill Balog qualified back to back to back during Wednesday’s program, all carrying a variation of the number 17. Haudenschild was best in class timing in 17th. Balog’s special Nationals paint scheme gives the MACC Fund a larger presence on the BSquared Motorsports car. The MAAC Fund supports childhood cancer and related blood disorder research. Balog has donated part of his winnings over the past three seasons to the MACC fund to the tune of over $13,000 dollars. The yellow color was chosen to promote Childhood Cancer Awareness Month in September. One local family that currently has a child battling cancer that attended the races this week was so inspired by Balog’s paint scheme they gave team members wrist bands which they are supporting as part of their Nationals week effort. Wednesday’s first four starters in the preliminary feature had Pennsylvania residences listed as their hometowns. Greg Hodnett (originally from Tennessee but lists Spring Grove, PA now as his residence), Tim Shaffer, Lucas Wolfe, and Brock Zearfoss held the first four starting positions. While Hodnett and Shaffer remained up front Wolfe dropped back after suffering damage to his left side wing panel. Zearfoss also dropped back to 10th place in the main event.